I am sorry, because I otherwise love his work, but this one is not up to par. Cute book in the inimitable Dr. Seuss style. Tells of an older man going into the oh-so-modern health care system. I winced as he was poked & prodded & x-rayed & measured by high tech devices. After a very long time, he is given over to a kind physician. No, of course not; he is given prescriptions for medications. Well done but too short. A funny, quirky, book about getting older, and being in the doctor's office. A great book for folks who grew up with Dr. Seuss, and can appreciate his humor as an adult, for adults, using the same rhyming patterns and silly nonsense words we loved when we were kids. It's cute and silly and fun. I think it'd be a great birthday present for people "of a certain age". This is the cutest, funniest book you will ever read. From what I have learned is the only book Dr. Seuss wrote for adults. Once you start to read the material your mind tends to think about your own doctor's office and you relate, relate and relate to your own experiences. 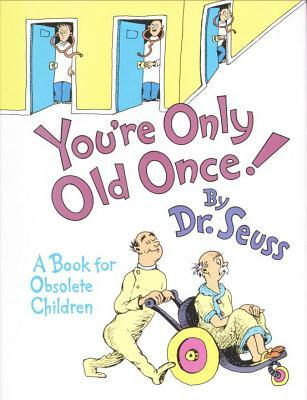 I originally read the book in a primary school library, during Dr. Seuss Month where I worked part-time . After reading it, I had to have my own copy.